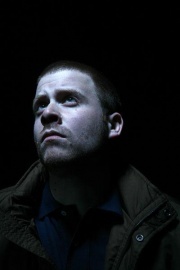 El-P (also known as El-Producto) is an American hip hop artist and entrepeneur from Brooklyn, New York City. He is the co-founder, owner and CEO of the Definitive Jux record label. El-P's remix of Nine Inch Nails' "Only" appeared on the Every Day Is Exactly The Same single. El-P and Trent Reznor also collaborated on a song entitled "Flyentology," which can be found on El-P's March 2007 release, I'll Sleep When You're Dead. El-P has also contributed productions and guest raps to albums by DJ Krush, Aesop Rock, Murs, Cage, Mr. Lif, Prefuse 73, Del tha Funkee Homosapien, Mike Ladd, The High and Mighty, Aceyalone and Atmosphere. He collaborated with Alec Empire on the first Handsome Boy Modeling School album and with Cage and Chino Moreno on the second. He was selected to work on Rage Against the Machine frontman Zach de la Rocha's solo album (something that Reznor also contributed to), although it has not been released. El-P also provided the soundtrack for the graffiti film Bomb the System. This page was last modified on 27 October 2016, at 14:32. This page has been accessed 25,164 times.